When it comes to the excellently conceived and curated group exhibitions, Canberra Museum and Gallery has outdone itself of late, demonstrating the institution’s essential role in an arts landscape that its larger cousins would like to think they dominate. This time around, it’s Mark Bayly at the curatorial helm for Word of Mouth – Encounters with Abstract Art, featuring the work of nineteen artists. Naturally, all are connected to Canberra, and furthermore to the ANU School of Art. Hodge has only recently returned to Canberra to work and paint. Until this point I’ve eagerly followed the development of his practice via online snippets, intrigued by the path his work has taken since he was painting stunning atmospheric landscapes at the ANU School of Art. His preoccupation with ambiguous spaces of nature – cloud forms, the ocean – formed spiritual interpretations and sublime readings of the landscape that now seem to have fluidly evolved into abstract works to the same (I would say even greater) effect. Now, structure and motif come into play as Hodge employs a framework of rules and patterns, exploring processes of collage and layering. ‘Magazine Mystics’, as a floor to ceiling grid of separate works on paper, is art that you could easily spend the day with. The number of ideas contained within these proportions, the wealth of raw material, gives a terrifying indication of the extent of Hodge’s talents. Each sheet could stand alone as an artwork, but for now sits in harmony with the wider assembly. As a whole the work is loud, but projects a resonance and unity – perhaps like a room of meditating people chanting as one. Most appealing is Hodge’s mastery of translucence and opacity paired with luminous, fluid colour, flickering between obscurity and light. I’m going to tell you this is not a show to miss, and then I’m going to tell you that tomorrow, Sunday August 19, is the final day. Cruel, aren’t I. 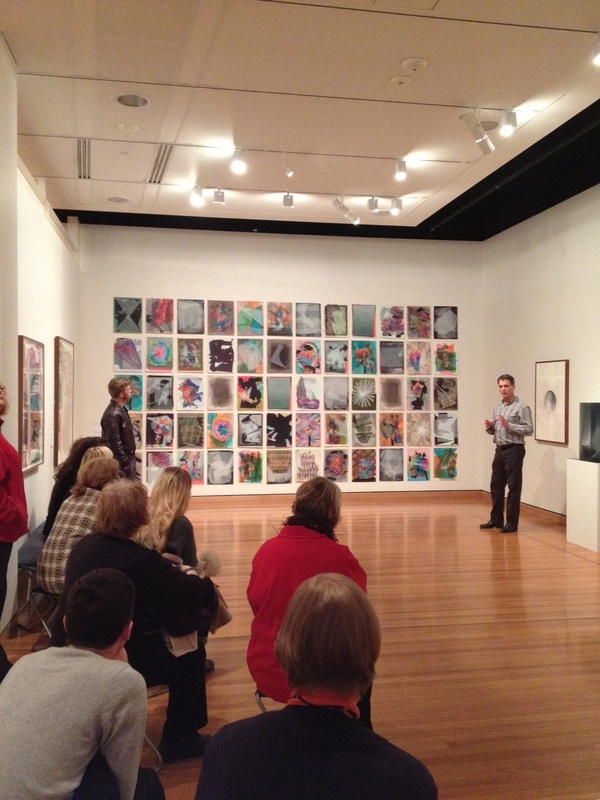 Word of Mouth: Encounters With Abstract Art is on show at Canberra Museum and Gallery. where is Derek O Connor’s work represnted in this exhibition? Only one of the FEW Canberrans consistent in abstraction for the last 2 decades? Hm good point. Would be great to see what Derek has been up to lately.. I agree with you about Gregs work, it is a stand out in the show and I spent a lot of time in front of his ‘wall’ being blown away by everything going on in there!